GoodReads Summary: Someone’s killing angels and turning the half human, half angel illorum warriors against their angelic supporters. If the supernatural baddy behind the attacks isn’t stopped soon, Heaven itself could fall victim. The Council of Seven has called in the best they’ve got to find the killers, and no one’s more surprised than Emma Jane Hellsbane when it’s her phone that rings. The phrase 'don't judge a book by its cover' definitely applies here. Even though the forbidden romance/love triangle went in a pretty predictable direction I still enjoyed it (and this is coming from someone who despises love triangles). I think the reason for this is because Cuccaro handled it well; it never overpowered the plot and Emma didn't turn into one of those whiny mc's who can't get their priorities straight. Also, Dan's actions and level headedness in regards to the love triangle was commendable. Seriously, the guy is a sweetheart. Often when I read a book, and then pick up the sequel it's been so long since I read the first book that I have to flip through it to refresh my memory. That wasn't the case here, though, as the author did a brilliant job of recapping the events of the previous book. I'm eager to find out what's in store for Eli (*swoon*), Dan, and Emma in the next installment of the Hellsbane series. 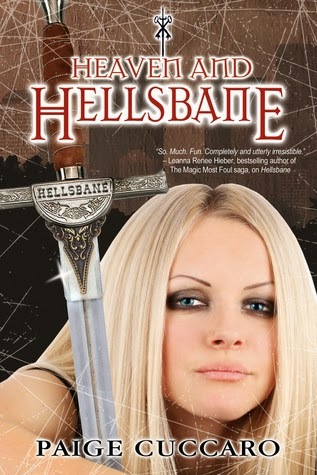 Even if, like me, you don't usually read adult UF I definitely recommend giving the Hellsbane series a go as it may just surprise you. FORBIDDEN LOVE! NOOO! I just cannot stand that... Though I'm glad it didn't bother you much! Great review! Heh, I'm glad you made a point of saying not to judge this one by its cover because umm, yeah... but it's always good to hear that a love triangle is handled well! I'm not an adult UF reader at all, so this one may be good for me. Thanks for the review - great job!